Hi, my name is Camilla Bertini, and I am a PhD candidate from the University of Nottingham. During my PhD, I have been supervised by Professor Julian Henderson and Professor Christopher Loveluck, and I have just submitted my PhD with a dissertation titled “Trade and glass production in Early Medieval Italy, England, and Denmark (late 6th - 11th century AD): compositional and isotopic analysis”. My main expertise area involves the study of ancient glasses, and more in particular the analysis of their chemical composition. Before moving to the UK, my main academic background was focused on the archaeological aspect of glass, hence mainly typology (the study and comparison of artefacts shape and decoration). I then discovered a whole different approach to the subject: I have learned that through chemical analysis it is possible not only to understand what raw materials have been used to make the glass, but also to assess where they were made. The technological aspect of glass-making fascinates me and at that point I decided to move to the UK to get an MSc in Archaeological materials at the University of Nottingham, and then go onto study for a PhD. My current PhD project involves the study of three different glass datasets dated between the late 6th and the 11th century AD: Comacchio (Northern Italy), Barking Abbey (Southern England), and Ribe (Denmark). I started to collaborate with Dr Simon Chenery (BGS) in July 2016, when I analysed my first batch of samples with LA-ICP-MS: this technique which measures the concentration of trace elements in the glass samples is still scarcely applied to glass studies, even though has showed much potential. In fact, most of the published studies still rely only on significant elements (EMPA) to assess the compositional nature of ancient glasses, although trace elements data can give a better complete knowledge of the nature of the recipe itself. My first aim was to use LA-ICP-MS not only as a mean to characterise further each chemical composition of glass, but also to understand mixing and recycling practices in glass manufacture by measuring the concentration of specific “recycling markers” (Sb, Sn, Co, Cu): understanding when glass has undergone through repetitive recycling cycles and when its original composition has been mixed with other recipes is crucial to understand the degree of manufacture processes occurring in any workshop. tesserae; fragment of a glass lamp; soapstone crucible with a layer of green and red opaque glass. 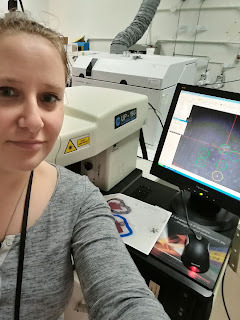 With the help of a NERC Isotope Geosciences Facility grant, I was able to analyse three different isotopes (strontium, neodymium, and lead) for 67 samples from two Early Medieval sites: Comacchio (Northern Italy), and Barking Abbey (South-Eastern England) in collaboration with Professor Jane Evans (BGS). 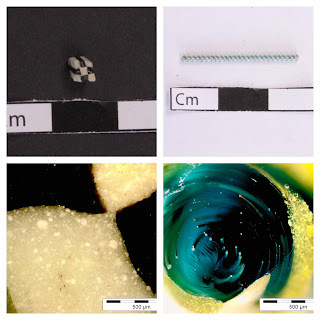 One significant gap in glass studies research up until now is that few isotopic data have been published on Roman glass and no isotopic data has been acquired for glass artefacts after the 7th century for Western glass. Looking at Barking Abbey glass through the microscope. We know from previous analytical studies that the main area of production of glass during the Roman and Early Medieval period were Palestine and Egypt. The same isotope analysis confirmed that raw materials for glass from the Levantine area have been used to make Roman and Early Medieval glass, therefore, my main hypothesis was to understand if samples from Comacchio and Barking Abbey have been indeed produced with raw materials harvested in the Levant. For example, was plant ash glass found in Comacchio (Northern Italy) made in Islamic primary production centres? Could we potentially finally confirm the trade of glass between the Islamic glass-making and the Venetian area? My second objective was to examine mixing and recycling practises by looking at Sr and Nd isotope data. I submitted my PhD in April: while I cannot reveal the results of my research just yet, all I can say that the data acquired is very promising and I cannot wait to finally publish my findings!